From left: Clayton Bertoletti, Jacob Selsor, Brady Cummings, Peyton Boysen, Joe Locher, Evan Smith, Hunter Hill, Jake Barker, and Jordan Mullen. 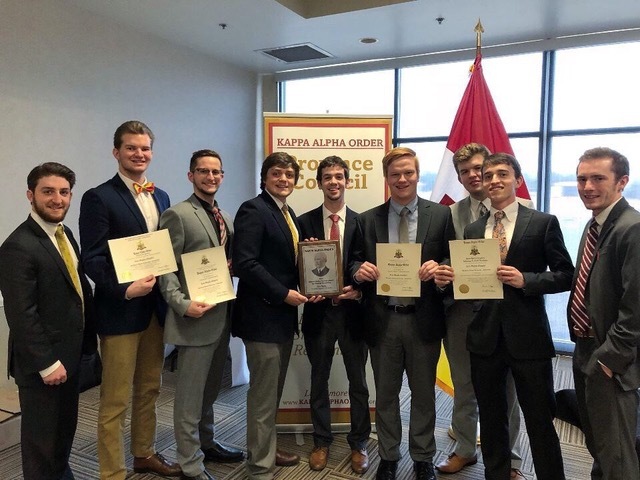 Congratulations to all members of our Kappa Alpha Order fraternity for earning five awards – including Samuel Zenas Ammen Award for Chapter Excellence – last month. The chapter also won awards for educational programming, scholastic achievement, and excellence in fraternal as well as social media communication. I thank them for bringing pride to themselves, our Greek system, and SIU Carbondale. SIU’s first fraternity and sorority were established in 1923. Today, our 35 Greek fraternities and sororities provide leadership, service and social experiences that add value to their members and to the campus. Too often, we read about the negatives of Greek life on other campuses, so it’s easy to forget about the benefits and values of Greek organizations. At SIU, for example, Greek students have higher graduate point averages, retention rates, and graduation rates than the student body as a whole. This is because they focus on academics through study hours, mentoring and other strategies. Members also rely on each other as part of a community. They volunteer on campus and regionally on projects. For instance, they work closely with Keep Carbondale Beautiful to support the Adopt-A-Spot program and clean-up initiatives, and they work with the American Red Cross to organize an annual Homecoming blood drive. And Greek organizations help attract students who are looking for the type of experience Greek life can offer. The old Greek row on the west side of campus reminds us that at one time, many fraternities and sororities lived on campus. I’m pleased to report that several chapters are working with their national organizations to explore bringing their houses to campus. This will be a long process, but it is one more step in revitalizing campus life.